Abstract. The skill of current predictions of the warm phase of the El Niño Southern Oscillation (ENSO) reduces significantly beyond a lag time of 6 months. In this paper, we aim to increase this prediction skill at lag times of up to 1 year. The new method combines a classical autoregressive integrated moving average technique with a modern machine learning approach (through an artificial neural network). The attributes in such a neural network are derived from knowledge of physical processes and topological properties of climate networks, and they are tested using a Zebiak–Cane-type model and observations. 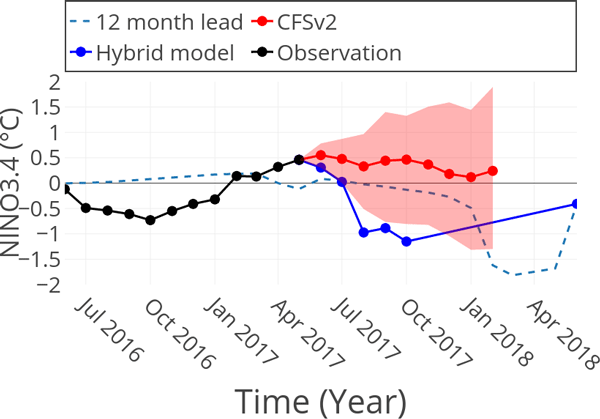 For predictions up to 6 months ahead, the results of the hybrid model give a slightly better skill than the CFSv2 ensemble prediction by the National Centers for Environmental Prediction (NCEP). Interestingly, results for a 12-month lead time prediction have a similar skill as the shorter lead time predictions. 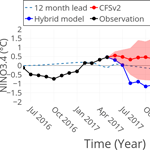 How to cite: Nooteboom, P. D., Feng, Q. Y., López, C., Hernández-García, E., and Dijkstra, H. A.: Using network theory and machine learning to predict El Niño, Earth Syst. Dynam., 9, 969-983, https://doi.org/10.5194/esd-9-969-2018, 2018.